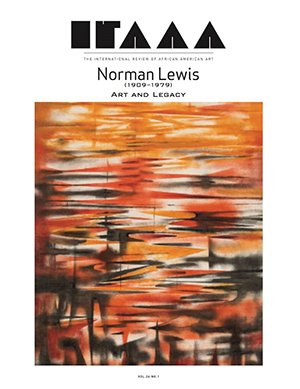 This issue of the IRAAA is dedicated to Norman Lewis (1909-1979), and coincides with the exhibition Procession: The Art of Norman Lewis on view at the Pennsylvania Academy of the Fine Arts, Philadelphia, PA (November 13, 2015 – April 3, 2016, followed by showings at the Amon Carter Museum of American Art, Fort Worth, TX and the Chicago Cultural Center, Chicago, IL). Guest Editors, Andrianna Campbell and Jacqueline Francis, scripted a series of seven questions as jumping off points for rumination, but gave respondents (including artists, art historians, curators and Lewis’ family and friends) free rein to address any issues they chose. The questions included the topics of Lewis’ legacy; the present status of abstract painting; the drive behind abstraction in the past and now; the importance of politics in relationship to Lewis’ work; the linkage of Lewis’ work to “black art”; analogous explorations of trauma viewed in his art and in the post- 2001 era; and responses of the importance of a single work of art by Lewis. This issue features articles written by, David Bindman, Henry Louis Gates Jr., Charles Gaines, Gwendolyn Dubois Shaw, Christina Lewis Halpern, Dore Ashton, Steven Nelson, Anthony Barboza, Darby English, David Carbone, Katy Siegel, Cella Irvine, Jack Whitten, Claude Lawrence, Robert Longo, Miani Johnson, H. Martin Weingartner, Odili Donald Odita, Anthony Smith Jr., Mark Bradford, LeRonn P. Brooks, Ph.D., Joyce Wellman, Susan Stedman, Ruth Fine, Lowery Stokes Sims, Ph.D., Courtney J. Martin and Rashid Johnson.